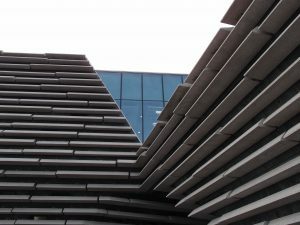 V&A Dundee is a veritable feast for those who love Scotland, design – and triangles. 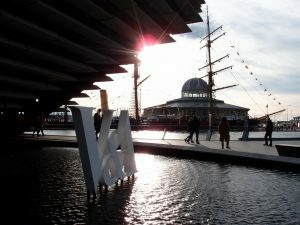 The V&A Dundee is an exciting new addition to a city that I have called home for just a couple of years. My mother is Dundonian, so from my earliest years, I spent a fair amount of time here visiting my grandparents. 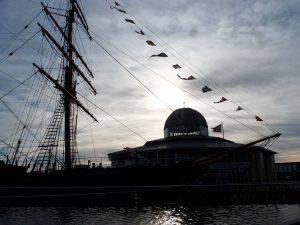 Then I lived a few miles away in Fife for fourteen years, so Dundee was my local shopping hub. 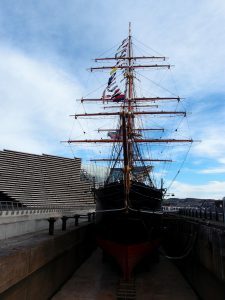 Dundee’s maritime heritage spans centuries of trade and military history culminating in the whaling and shipbuilding of the early 20th century when the RSS Discovery set off for the Antarctic with Scott and Shackleton aboard. 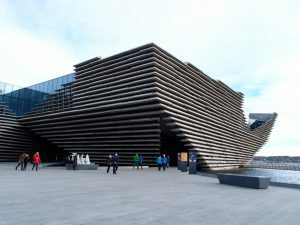 In Dundee, we have two historic ships, the Unicorn in the nearby docks and the Discovery herself, right next to this new museum. However, with decades of industrial decline, Dundee wasn’t quite at its peak sparkly best in recent years. 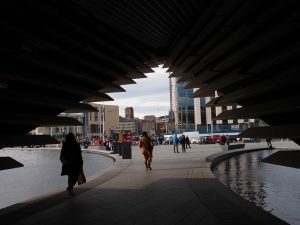 All that has changed, however, with an urban regeneration that has put us back on the cultural map! 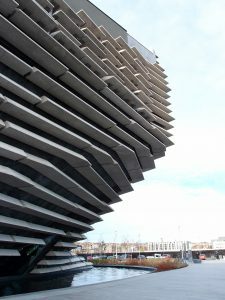 Along with the V&A Dundee, the city has a lot to be proud of, sitting at the cutting edge of video game and scientific development. 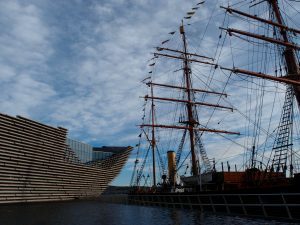 The cultural scene has stayed strong, with the Dundee Rep and Dundee Contemporary Arts undergoing sprucing up to greet the new millennium in style. And lest we forget, its pub and dining game is second-to-none. 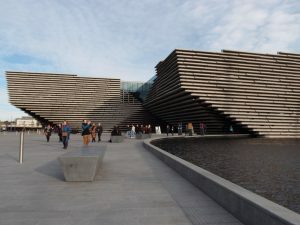 In fact, as a local who is always looking for dog-friendly places to eat, I am happy to report that Dundee is one of the best cities for dog-friendly dining. 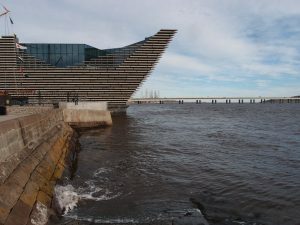 One of the great tragedies of Dundee only a few years ago was that there was little connection to the River Tay. This city of whalers and ferries had lost the immediacy of the water through dated town planning that left the waterfront cut off from the city centre. 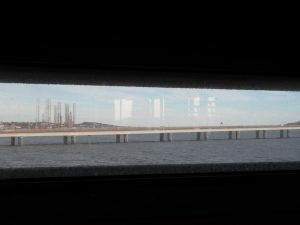 To reach the banks of the Tay you had to navigate steps and hamster tubes over dual carriageways, and there wasn’t a lot to do once you got there. This has all changed with the waterfront redevelopment project. Now there is a sense of openness and – as a local driver – a much more user-friendly road system. 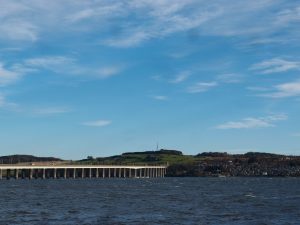 For a while there, every time I came off the Tay Road Bridge it felt like the route was different, but now that it has been finished and usable for a good few months I’m so happy with it. Pedestrians can rejoice – this is a walking and wheeling-friendly area now. 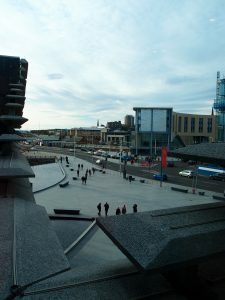 Slessor Gardens and the riverside walk offer relaxing spaces, and more is yet to come. We should even have an “urban beach” with WiFi before too long. Kengo Kuma and Associates were given the commission in 2010. 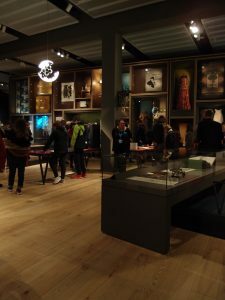 The museum was established in partnership with V&A in London, and the mantra throughout the process has been to create a “living room for the city”. 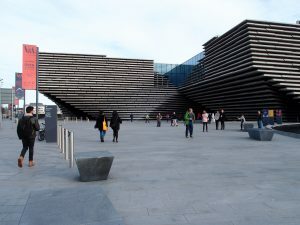 Effectively, this means that the V&A Dundee should be a meeting place and comfortable space even for those who are not visiting the paid galleries or patronising the shop and restaurant. The twisting shapes of the exterior create a sense of movement that evokes waves. And the shape like a ship’s hull complements the Discovery sitting next door, now seen across a shallow pool connecting the two structures. The archway through the building is a conscious echo of the royal arch that used to stand nearby. One of Dundee’s lost treasures, it was built in 1844 to commemorate a visit of Queen Victoria and Prince Albert (appropriately enough), but it was sadly demolished to make way for the Tay Road Bridge. 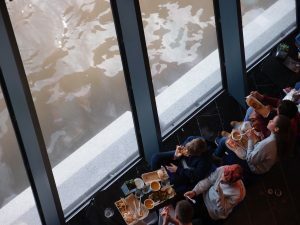 Inside, the sense of connection to the water predominates, with windows providing unexpected views from different heights throughout. It is a thing of beauty, with every angle offering new views through and beyond the building. if you are – like me – a fan of the triangle, this is a feast for the eyes. Pleasingly, this follows through from the logo itself, and I got a bit carried away with all the photos on the day. As an accessibility blogger, I am of course excited to see that the lift shaft is a central feature of the design and not tucked away in a functional corner. Here is only the briefest of overviews of the collection. 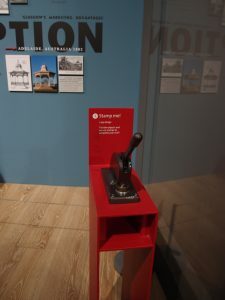 I didn’t visit the paid exhibition – I’ve promised to return with my father who is a ship enthusiast – so I’ll talk more about the museum itself another time. 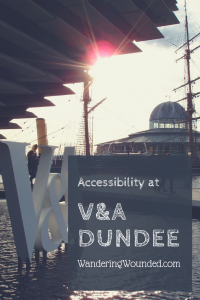 The V&A Dundee covers design in all its forms, carrying objects, design and manufacturing processes and interactive media. 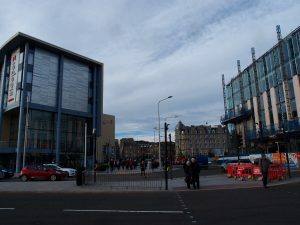 The centrepiece is the Scottish design galleries. 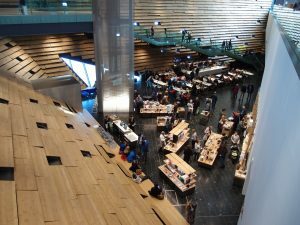 These show off local and national treasures that Scotland has given to the world. 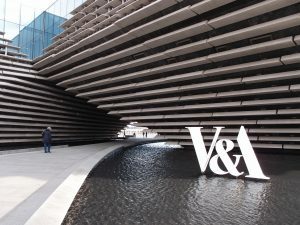 There are three hundred exhibits from the V&A collection, along with items from other museum and private collections. 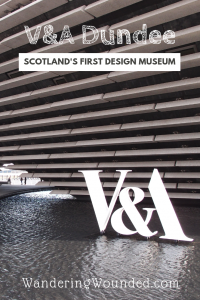 There are big-name designers, such as Vivienne Westwood and her use of Scottish fabrics, but the museum takes time to honour the craftsmanship lying behind trends. While the originators may be anonymous, Harris tweed and Fair Isle knitting are icons of Scottish cultural heritage and it is right to honour them here in such a prominent way. In fact, at points I would go so far as to say that the positivity and confidence of the presentation is a downright moving counterpoint to any cultural inferiority complex Scots might exhibit. Some people may find the lighting low in the galleries, but the photo below is a fairly accurate representation for guidance. 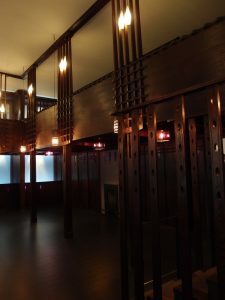 The star of the show is the Oak Room, designed by Charles Rennie Mackintosh in 1908. 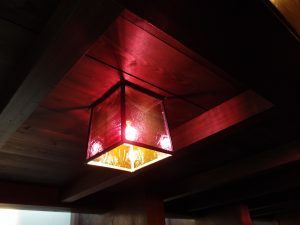 Catherine Cranston, the owner of a Glasgow Restaurant in Ingram St, commissioned the tea room interior. The Tea Room closed in 1951. Thankfully, the Oak Room was removed for storage by Glasgow Museums in the 1970s before the building was redeveloped. 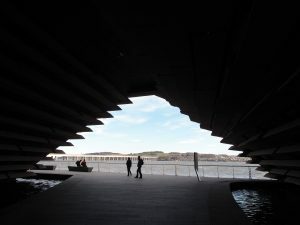 The V&A Dundee is one of the most universally accessible buildings I’ve ever visited. In fact, I can’t think of a museum that has done better in terms of meeting diverse needs. 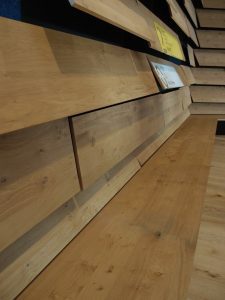 The floors are beautifully smooth, as one would expect in a brand new building. 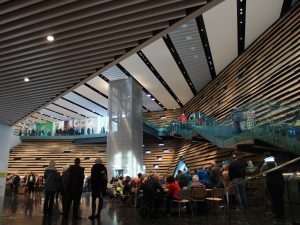 There is level access throughout and lift access to the exhibition floor. There are hearing loops everywhere you would need information from staff and in the learning suites. Mobility scooters are welcomed and wheelchairs are available to borrow. 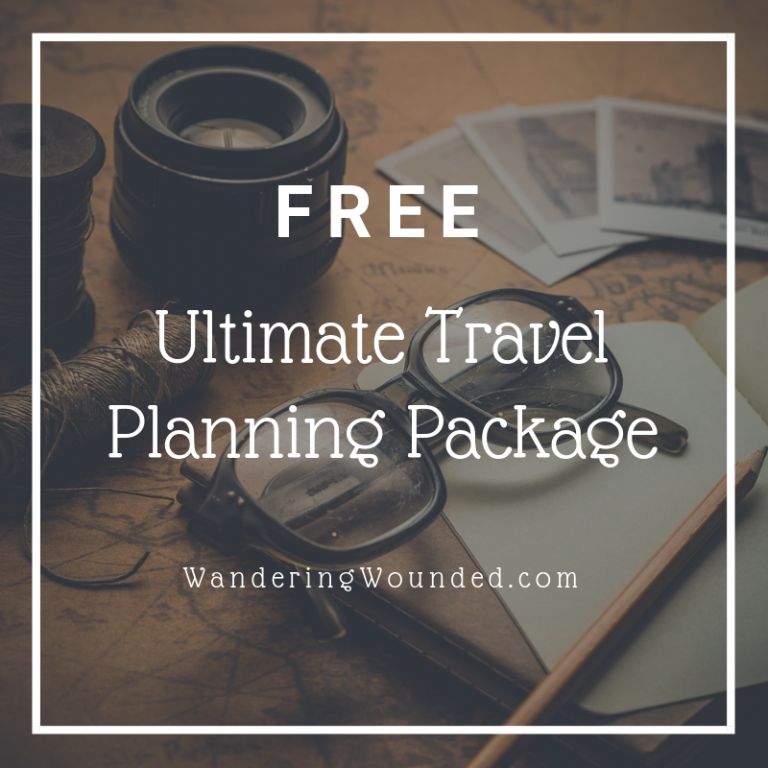 Additionally, BSL and touch tours can be arranged. These are the kind of accommodations that you would expect from a modern building with an awareness of the importance of disability access. 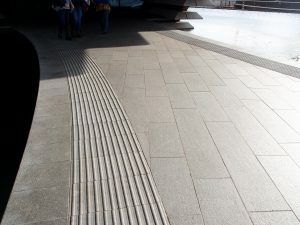 But it is in the little touches that go beyond the minimum to make it not only accessible but comfortable that truly make this an inclusive building. For a start, the tone of the information leaflets and website is positive and open. They welcome contact via a dedicated email address and have large print information leaflets. There are accessible toilet facilities on both levels, and one of them is a proper Changing Places toilet. 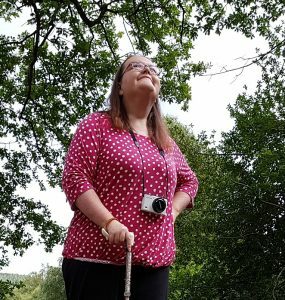 Then they go beyond the obvious and offer water bowls for assistance dogs and advice on local toileting venues for your pups. 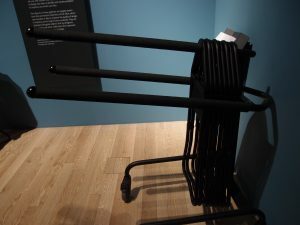 If it sounds that I’m getting overly enthusiastic about this, that’s because I was very excited about by the next thing I discovered: portable stools in the galleries! And that’s them just sitting there, ready to be claimed by anyone who needs them. No gatekeeping here, and they seem to keep on top of returning them to the entrance so you can get them when you need them. I was there at a busy time and they didn’t run out. The cafe is great, but if you have complex dietary needs or simply want to bring your own food there’s even a picnic area. Finally, there were benches everywhere, and seating is an integral part of the building. 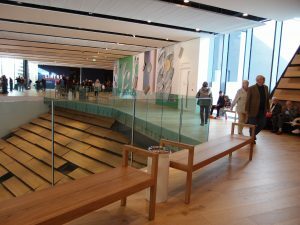 As well as the benches, there is seating around the walls on both levels, which means there are even places to sit in the shop. 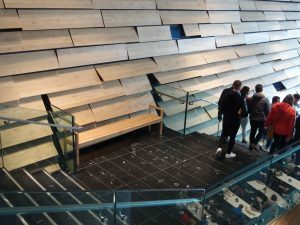 There are even benches on the stairs if you’re able to take them in stages. 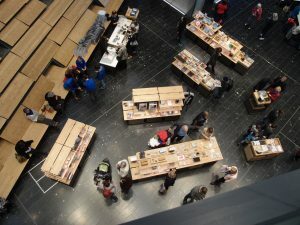 I don’t know what else they could do to be inclusive, but the impression I got from talking to the people at information was that they would be very receptive to any suggestions. I love this building. You should go. Right now. And if that doesn’t convince you, you can do this little stampy thing all the way around. 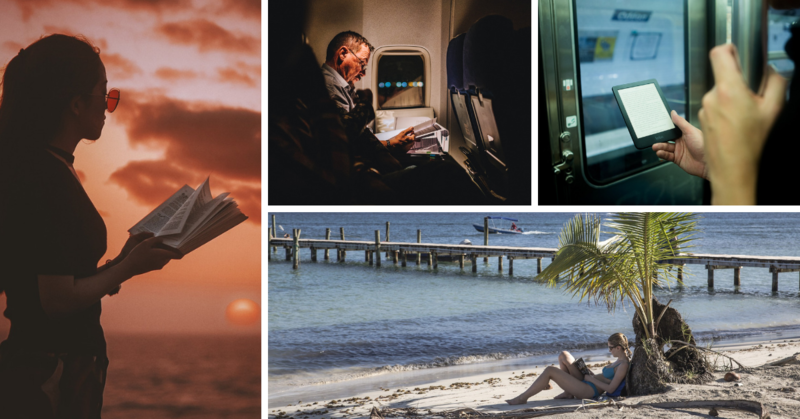 Previous Previous post: 11 Top Travel Books to Inspire Your Wanderlust!